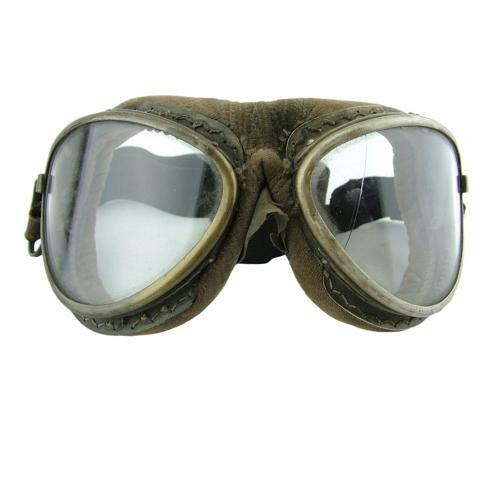 Imperial Japanese Army/Navy Goggles. Manufacturer marks 'SS'. Bronze coloured lacquered aluminium frames stitched to pale brown padded velvet cushions. Fitted with curved elliptical clear glass lenses and a wide adjustable elasticated strap. This is a relatively early pair with quality leather fittings, glass lenses and brass frame fittings. Later goggles used cheaper metals and plastics. The frames are in good condition though the finish is a little worn/rubbed. The velvet padding shows use and rubbing to the rear and the silk nosepiece is soiled and worn. The right clear glass lens is excellent but the left has a crack. Both strap attachment points are good but the actual strap has been replaced with plain black elastic. This is evidently quite old and worn. Although not perfect, still a decent pair of goggles and they display quite well. Stock code G23092.